Dive right in – this property is only a 3-minute walk from Galei Galil Beach! 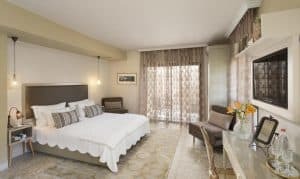 A 5-minute walk from sandy beaches, the Shtarkman Erna is set in a quiet yet central area of Nahariya, 500 m from Ga’aton Boulevard. This family-run hotel offers elegant, air-conditioned rooms with free Wi-Fi. Shtarkman Erna Boutique Hotel dates back to 1959. All rooms include cable TV, telephone and a small fridge. Some rooms feature a spa bath. The hotel has a private, peaceful garden where drinks are served. Bicycles are available for hire, and there is free parking nearby. The hotel can arrange excursions to destinations such as Haifa, the Golan Heights, Jerusalem and the Dead Sea. Nahariya Train Station is 1.5 km away. Guests have discounts in local restaurants and for tickets to Akko and Rosh Hanikra. During July and August, the hotel offers free entrance to a beach and country club with swimming pools, tennis and more.